Last Thanksgiving I helped out my parents by gathering all the walnuts from their walnut tree. I did a pretty extensive job of it, and was able to collect a giant basket full of nuts. I made the deal with them that I would be able to keep half the nuts I collected, as I love to use walnuts (especially fresh ones) in my baking. 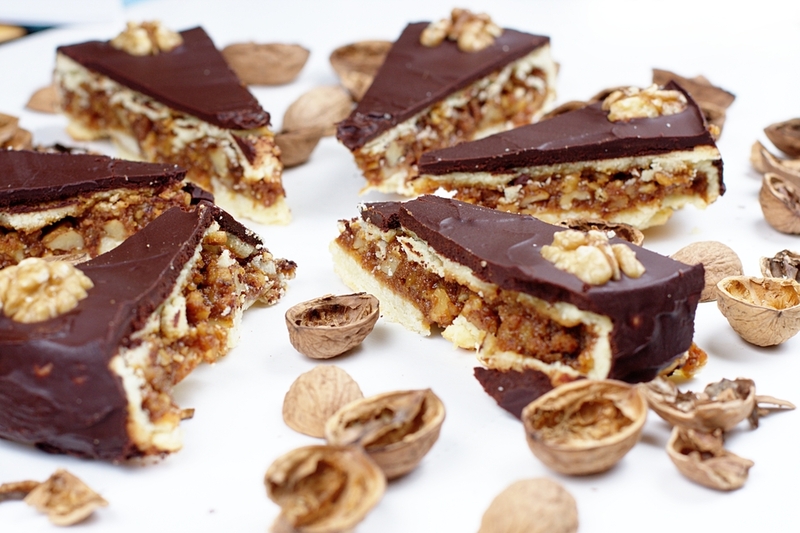 Over the past few months I had made quiet a few different treats with the walnuts, however still had a large amount of nuts left, and really wanted to find a very walnut heavy recipe to use them on. From the recommendation of a blog I read, I picked up the cookbook “Maida Heatter’s New Book of Great Desserts”. What did I find as one of the recipes in the book? 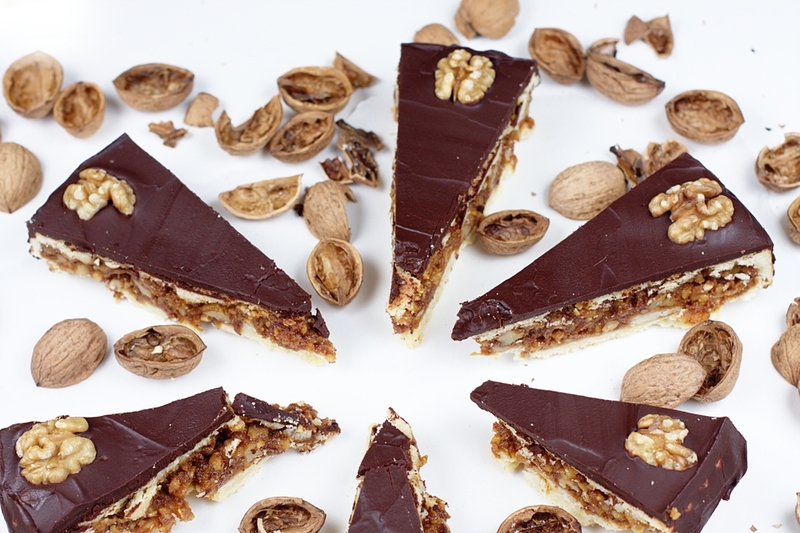 A walnut tart recipe! Basically the way the tart is constructed, was to make a shortbread style crust that you would fold around a caramelized walnut filling. You basically roll out the crust and lay half of it into a flan/tort pan. Then you fill crust with the caramelized filling, and finally add the second half of the crust on top to seal it all together. Once you have baked the tart, and it has cooled, you spread it with chocolate. Now I wish I could tell you this tart turned out perfectly, but I can’t. The day I decided to make the tart, I was a little bit tired and hung over, not to mention I had to meet some friends for a concert. So basically I had no concentration and was in a big hurry. Not the best time to try a new recipe you have never done before. Basically the biggest problem I had was with my pastry. My biggest problem was that after I had mixed it, I didn’t knead it enough so that the pastry balls were fully mixed. This became problematic when I went to roll out the pastry as it started to break apart and cause holes. For the most part I was able to fix things with water and left over pastry dough, but it was still a depressing looking. Luckily after covering the tart with chocolate a lot of the mistakes were hidden. As far as taste goes, the tart was very delicious. I served it up the day after I made it with whip cream and fresh strawberries. 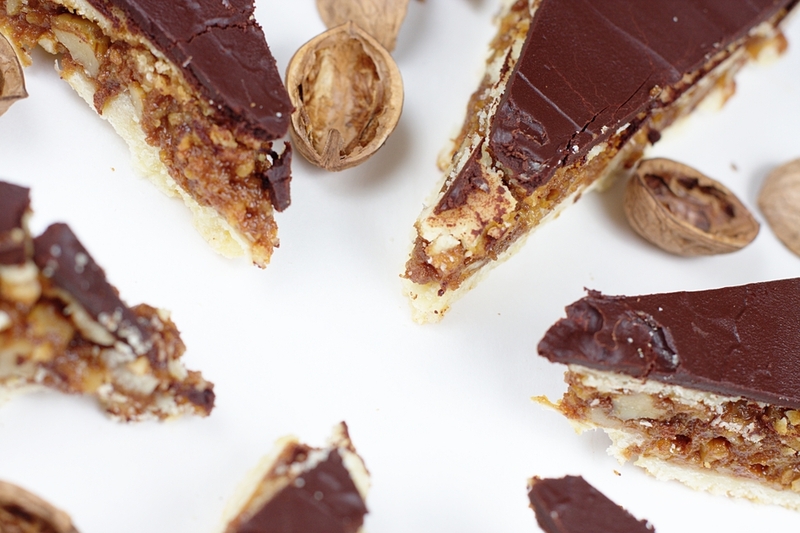 This added an extra layer of decadence to the already decadent tart. 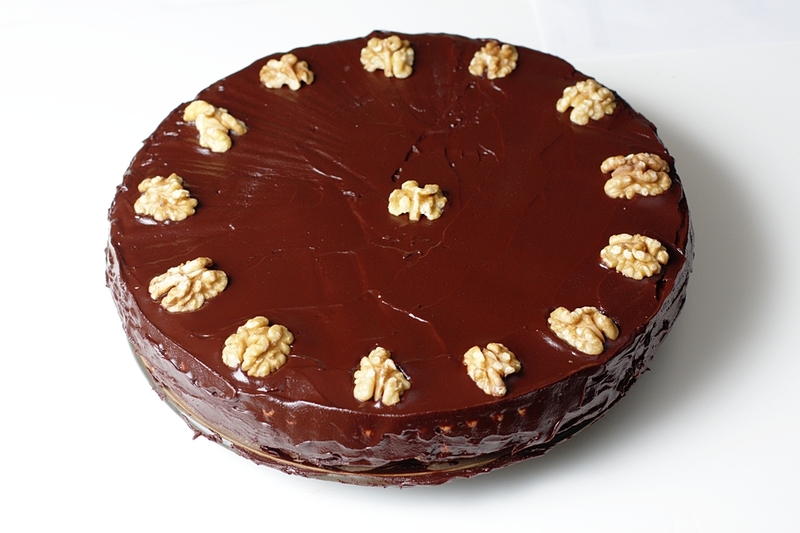 Unfortunately now I am fully out of walnuts, so I will have to wait until the fall to try this recipe again. Definitely is worth a second crack. In a saucepan bring sugar and water to a boil. Stir until the sugar is fully mixed into the water. Let the mixture slow boil for a good 7-8 minutes until the syrup starts to caramelize and turns a rich brown color. Remove from heat and stir in the milk and butter. Watch out for the steam this will produce. Stir the mixture until fully mixed together. Return to the heat and let simmer for a good 15 minutes, stirring occasionally. After the 15 minutes stir in the honey and the nuts, then pour into a large bowl. Let stand until cooled to room temperature. Mix all the dry ingredients in one bowl and the water and egg yolks in another bowl. Cut the butter into the dry ingredients until pea size. Slowly pour the egg yolk mixture into the dry ingredients and mix until dry and crumbly. Knead the dough with your hands until it holds together. Be careful not to overwork the dough and melt the butter. Separate the dough into 1/3 and 2/3 parts and roll each into a ball. Place in the refrigerator for 30-60 minutes. On a floured working surface roll the larger portion of the dough until it fills a 11″ x 1″ removable bottom tart pan. Make sure you roll it wide enough to have about an inch of overlap on all sides. Place the dough into the tart pan with the excess overhanging the pan. Spoon the filling into crust. Roll out the second dough to be the size of the pan. Fold the overhang onto the filling then wet the top of it. Place the second dough piece on top of the crust and filling. Where the pieces connect squeeze them until pasted together. Bake for 20 minutes until golden brown. Make sure not to over bake. Let cool until room temperature. Heat the chocolate (chopped) and butter in a double boiler over moderate heat. When it begins to melt whisk until smooth and silky. Remove from heat and let cool for 5 minutes. Pour the chocolate over the tart. Using a large chef knife or a skinny metal spatula spread the chocolate around the top of the tart until perfectly smooth. With a regular spatula spread the remaining chocolate around the outside of the tart. 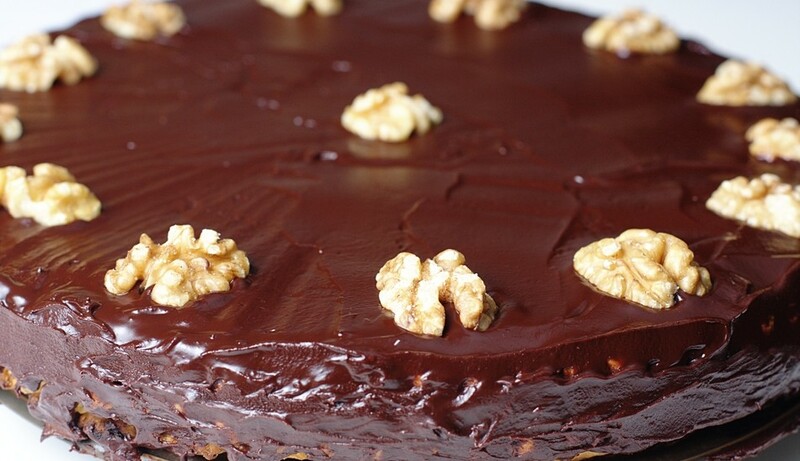 Finally place the walnut pieces around the tart to decorate. Not as difficult as it sounds. Just make sure you take your time. If you make this let me know how it turns out!